The British state - the police, courts, parliament and media - has responded to the uprisings in English cities with a viciousness and hypocrisy that only the imperialist ruling class and its defenders are capable of. They ranted about destruction, anarchy, violence, disorder and lawlessness while the Royal Air Force had flown over 15,000 missions against the people of Libya and dropped high explosives on residential areas killing innocent men, women and children. What causes the greatest damage, we ask, a half brick or a jet fighter loaded with murderous missiles! Which is the more anti-social crime? Helping yourself to a pair of jeans or helping yourself to a country's oil? In this context, the reality of ruling class violence and lawlessness, we look back at the last year of the Glasgow Defence Campaign's work and the argument that we made in August of 2010 that the British state was preparing to attack the living standards of the working class through the cuts budgets and would attempt to control and criminalise all resistance to the rule of the wealthy. As a Fight Racism! Fight Imperialism! (FRFI) supporter stated at a May Day rally in Dundee this year: the defence of working class living standards is the defence of democratic rights. 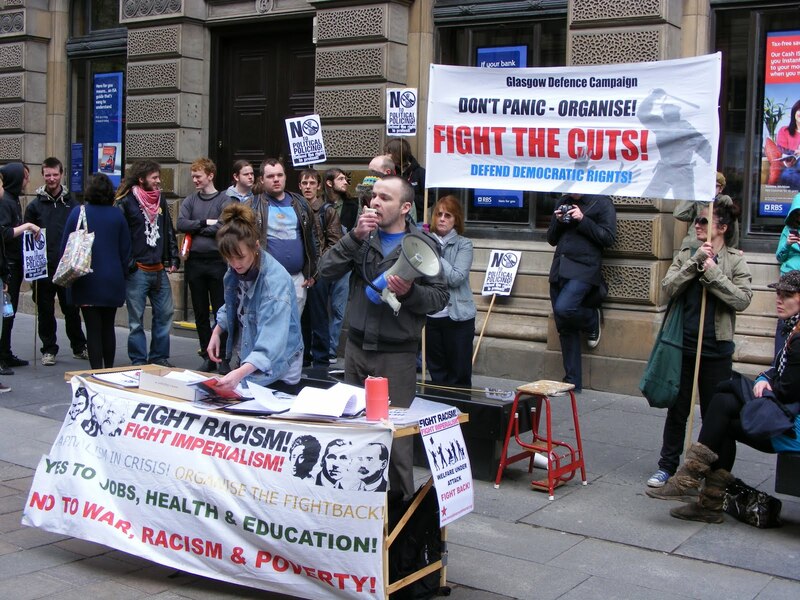 Comrades from FRFI got out onto the streets of Govanhill, Glasgow last year to protest at the austerity budget of the newly elected Tory-Con Dem government. Within hours we were facing Strathclyde police's attempts to immediately close down our leafletting and petitioning. Regulations were cited and invented to try to force us off the streets. Our human rights to expression and association - clearly upheld in law- were ignored by the bullies in uniform as newspapers and stalls were seized and charges issued against FRFI supporters. We stood firm in the face of this political policing and fought back by openly challenging the police censorship and gathering support from every group and individual sharing our concern about the attack on democratic rights. We urged unity and public protest to defend those rights and warned that we were only at the begining of the state's attempts to limit and make any protest ineffective and isolated. Towards the end of that year as students took to the streets everywhere to protest at education cuts we recognised the emergence of new police tactics to control, intimidate and criminalise protest. From Parliament Square in London to George Square, Glasgow, the kettle was on. FRFI supporters were targeted and arrested by police on protests in December and January and hauled in front of sham courts. Delayed arrests, house raids, frame ups, surveillance and assault were evidence of the state giving the green light to the police to close down protest. The Glasgow Defence Campaign was established to meet these attacks in kind, recording and exposing every incident of police harassment, naming and shaming the officers involved, taking protests to the doors of the District and Sheriff courts and the streets of Glasgow. 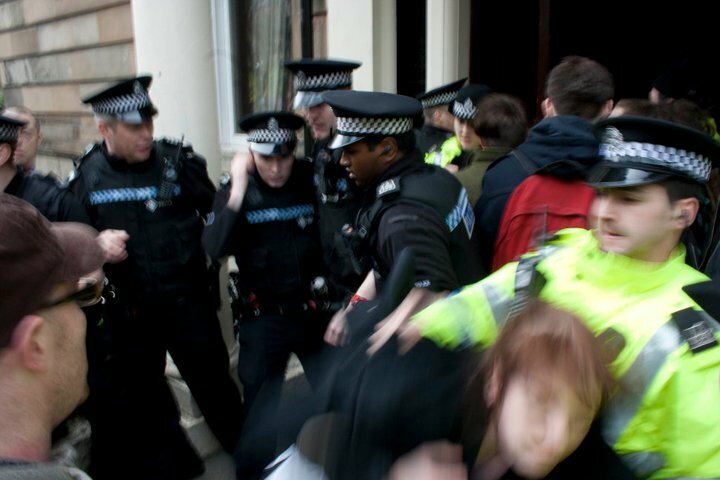 The thuggish police operation to evict the Free Hetherington occupation on 22 March educated new layers of young people in the need to organise rapidly against such repression. The even more brutal eviction of Margaret Jaconelli soon followed. 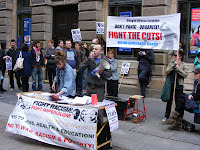 On 16 April, after another week of arrests and convictions of FRFI and other anti-cuts activists, the GDC held a defiant rally in Glasgow city centre to demand an end to the political attacks, uniting progressive forces. Five days later, all charges against seven activists were dropped as they were due to appear in court. This victory showed that the anti-democratic activities of Strathclyde police and their paymasters could be effectively challenged if people stood together. Now, faced with the anger of inner city youth facing poverty and unemployment - sparked off by another police killing - the British state's real methods of operation are obvious to many more people. Their idea of justice is to ignore the theft of billions by the wealthy elites represented in the cabinet and parliament or the corruption of policemen and women by the millionaire press and to treat the working class as criminals deserving only of a prison cell should they rebel. The Glasgow Defence Campaign states its commitment to the argument that the defence of democratic rights is the defence of the working class. We define that working class as workers in jobs, youth in revolt on the streets, the disabled and poor, immigrants and asylum seekers- all those who the rich are trying to make pay for an economic crisis not of their making. The police who tried to close down our political activity last year and who were made to back off by the campaigning work of the Glasgow Defence Campaign have been made bolder and more arrogant by recent developments. At the time of writing this statement, concern is rising about a steep rise in deaths at the hands of police - 3 killings in 8 days. Recent arrests in Glasgow and the return of police interference in legitimate and legal political organisation should put us all on alert and demands that unity and solidarity must be fought for and built in the struggle to defend democratic rights and in the fight for real justice.